The first time I had amaretti cookies was in the Piazza San Marco in Venice. I stumbled upon a small cart selling a variety of ornate confections. Amongst all the tinsel and colorful sugar my eyes were drawn to a small cellophane bag tied with a small bit of gold ribbon. In it were little pale cookies that looked ordinary but enticing nonetheless. When opened the bag released a heady perfume that overtook me and those around me. Its sweet almond aroma always takes me back to the Piazza and its surrounding cobbled streets and bridges. Amaretti are little cookies that are light as a feather, yet have an intense sweet almond flavor. They’re airy, delicate, and oh so simple to make! This amaretti cookie recipe takes no more than 4 minutes to put together and they bake quickly. They taste fantastic on their own, but I’ve also been known to grind them up into a powder and add it to flavor pumpkin bread in lieu of cinnamon and spices, or add them to the batter of vanilla cakes or pancakes to give it depth in flavor. 1 Prepare oven and baking sheet: Preheat oven to 300°F and line baking sheets with parchment paper. 2 Make the dough: In a food processor pulse together the almond flour and sugar. Add the vanilla and almond extract and pulse for a few seconds. Add the eggs, one at a time, and continue to process until the dough is smooth. 3 Dollop dough onto lined baking pan, dust with sugar: Place teaspoons of the dough on the parchment paper-lined baking sheet and dust with sugar. 4 Bake: Bake at 300°F for 24-30 minutes or until golden brown. They will be slightly chewy at first, but they will be nicely crispy as a day or two goes by. Hello! All photos and content are copyright protected. Please do not use our photos without prior written permission. If you wish to republish this recipe, please rewrite the recipe in your own unique words and link back to Amaretti Cookies on Simply Recipes. Thank you! These cookies are amazing! They turned out perfectly – crispy on the outside, chewy on the inside. I highly recommend this recipe. Absolutely delizioso Easy to make. I rolled mine and baked them 30 minutes. I want them crisp as I will use them in a recipe where I pour desert wine over them. These were so delicious and easy to make. I had been in Italy and bought some Amaretti cookies there, and needed to make my own! I didn’t have a food processor, so used a blender, and that worked fine. These are addictive! Loved how easy these cookies are made! I just made them for an Italian-themed dinner we have. I used sliced almonds, because that was what I had, but loved the texture that came out. I used 4 cups of sliced almonds, 1 3/4 sugar and 4 egg whites. I beat the whites separately and folded the almond mixture after. I also forgot to sprinkle the sugar on the first batch :$, but I liked how they came out, better than the ones that had the sugar. Came out very tasty and my kids and hubby loved them as well. I’ll post my photo with your hashtag on Instagram, after the dessert is assembled (gelato, amaretti cookies and a little raspberry balsamic on top). I am hoping these cookies can be baked and then left a couple of days (not sure if I can cope?) and then ground and sprinkled on a variety of treats? That’s what we do with our Lazaronni amaretties…grind/sprinkle on grilled peaches/nectarines and then, a drizzle of Amaretto de Saronno. A summer sensation! Also, sprinkled on any type of pudding/tapioca/whatever. Wonder how long they would take to get hard enough to grind or hammer in a plastic bag..which is how we process here? Thoughts? Just made these today… Fabulous!! Marzipan is like my favorite food and these taste like it! I added an extra half teaspoon of almond extract which helped achieve that super-almondy flavor. For the sugar, I used the Domino quick-dissolve kind, for making iced tea and cocktails. It’s superfine and I imagine it’s pretty much the same as “baker’s sugar,” which I could not find. So easy to make and absolutely delicious, thank you so much!! You are right – these are quick – in 45 mins I was eating one warm from the oven. I did not use the food processor nor the fine sugar. There have been discussions about using apricot kernal flour. I just love the flavour of almonds and apricots. While I was searching for amaretti recipes, I found one that mentioned including apricot preserves so I added 3 tablespoons to the batter. They came out wonderful. Although I like my cookies crisp (well done) I loved the soft and chewy texture. I stored them in a jar that kept them soft for the week. 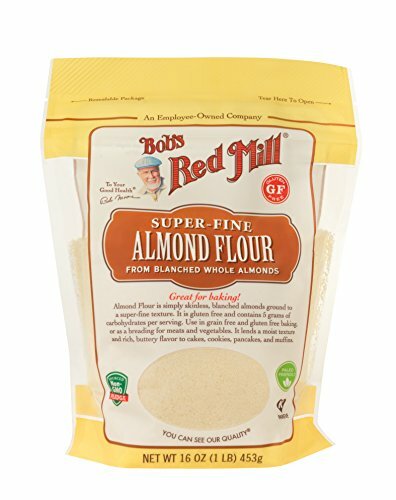 You can find almond flour at Trader Joes. Oh! This is absolutely delicious! As a matter of fact, I’m typing this with one hand, and holding a piping hot cookie in the other. I couldn’t wait to try them! The almond flavor is absolutely amazing! This is a must-try! I made these cookies last week and they are very good but I have never made cookies in my Cuisinart food processor and it was a total mistake. I followed the recipe but when I added the eggs my Cuisinart started smoking and I thought it was going to start a fire. The dough was so sticky that I think it bogged down the motor. So as I said yes, delicious cookies but at the price of my beloved food processor I don’t think it was worth it. I have a recipe that call for the whole egg. Is that right? Made these cookies today and I’m afraid they were too runny. They came out like pancakes. Is the dough supposed to be a bit stiff can’t remember if I put 2.5 cups of flour in or 1.5 cups. This recipe is excellent. I always double the batch as they are a family favorite, plus an office favorite. To add to the look and taste, I roll the top half of the teaspoon of cookie dough into sliced almonds. I flatten cookie with back of spatula and then drizzle with honey before baking. I bake for 21 minutes. My daughter who lived in Troy, New York for a year said that these cookies were as good as the almond horns at Bella-Napoli! Thank you for the cookie recipe. I just finished the first batch (1/2 a recipe) and the cookies are delicious and easy to make. Yummy yum yum! I will experiment and perfect the recipe to my own needs, I am still testing chewy stage and crisp stage, size, etc. Made these last night and they’re a hit. I don’t have a food processor so I just mixed the ingredients in a bowl with a hand mixer using the beaters. No baker’s sugar either so I just used regular granulated sugar. Also no almond extract so I put a little more vanilla. Still turned out awesome. I baked them for 26 minutes and they’re a little pale with darker edges and are nice and chewy. Thanks for the recipe! Saw it, made it, ate it. I was inspired to whip up a batch of these this afternoon. Trader Joes sells Almond Meal and it worked great. My children love these cookies, dunked in milk. I piped them on the sheet using a pastry bag, that was more efficient and produced equal sized cookies. I will however beat the eggwhites stiff and fold the almond mix in that the next time I bake the cookies, I remember the Amaretti rather round and poofy. Either way, the flavor is wonderful and I will make these again, my kids suggested to make them for Christmas for Santa! Is there any way to adapt this recipe to a college kitchen without an electric mixer/food processor? UNBELIEVABLE ~ but true! If you love almond anything, this is for you! I am not a baker (yet) but this recipe was a snap and the cookies were inhaled immediately. I made them in the Cuisinart with the plastic baking paddle (first time I ever used it) and found I needed to keep stirring up the bottom contents to incorporate all. A zillion Thanks and also for the tip on underbaking; it really worked well! This is the best cookie recipe I’ve ever made/eaten or heard of. The only thing that might top it would be a death-by-ginger cookie, but I’m not even sure. My roommate, my sisters and my mom all said the same. If you love almond flavored pastries, this will not disappoint. The flavor is delicate, almondy and elegant, it’s in a class of its own. My only gripe is that almond flour is expensive, but the cookie is still worth it. One problem I had was the flatness of the cookie. It would pan out. The other thing is that these cookies wouldn’t turn golden unless they were overbaked (for me). So . . . watch out! I like mine chewy though. The other thing is that I killed my blender mixing the flour and sugar. For my purposes, the cookie still tastes amazing without the food processor step, but maybe it affects the shape and lightness (mine were a little weighty, but the flavor is so light it doesn’t matter). Besides the food processor fiasco, and learning to separate eggs, this recipe is not hard, especially since the ingredients are few. My last thing- what to do with the three lonely yolks? pudding? Vincenzo made (and purchased) amaretti and ricciarelli for the entire month of December. He flattened the amaretti cookies with the back of a spatula and baked them until crispy. Ricciarelli were essentially the same recipe as the ameretti (though Vincenzo would disagree), with a little honey and no vanilla. These were baked only until soft and he often dusted them with powdered sugar. He topped them with candied cherries pressed into the top, half with red cherries and half with green. Oh so festive!. He made these by taking balls of the dough and pinching either side them into “mandorla” shapes. Mandorla means almond, but it also means halo, particularly the elongated halo surrounding the Madonna. According to Vincenzo, this is why these cookies are so popular at Christmas. Added bonus- these cookies are naturally gluten free! Preheat to 350°F. Line baking sheets with parchment paper. Mix the almond flour with 1/3 cup of sugar. Beat egg whites with salt until soft peaks form. At this point, while beating the eggs slowly pour in the honey. Continue beating egg whites until firm, shiny peaks form. Beat in almond extract. Fold in the almond flour and sugar mixture into the egg white mixture. Form rounded teaspoons, pinching opposite sides into point and flattening slightly to form almond shape (mandorla). Drop the mandorla into powdered sugar. Remover after coated, and top each with a cherry or almond. Bake until cookies are golden brown, about 25 minutes. Cool cookies on sheets 5 minutes, then transfer to racks to cool completely. It is definitely better to beat the egg whites to stiff peaks and fold them in with a metal spoon. You get a lighter texture. It isn’t really necessary to process the almonds and sugar unless you can’t get ground almonds and caster/superfine sugar (neither are a problem in the UK!). After all, the recipe is probably older than electricity! You can buy ground/powdered apricot kernels online – there is at least one outlet in the UK but the Americans have apparently banned them on health grounds. I’ve never seen them in a shop and they’re not cheap but you don’t need much – maybe substitute 1/6 of the almonds for ground apricot kernels.